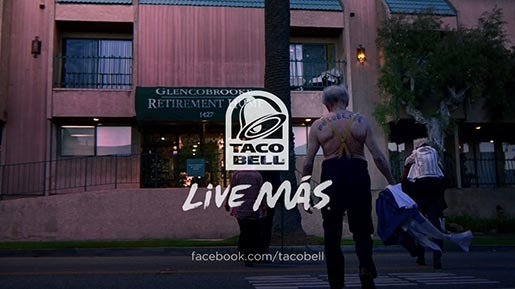 Taco Bell has released “Viva Young” (Viva Mas), a 60 second commercial designed for airing during the Super Bowl, featuring 87 year-old Bernie Goldblatt and friends on an epic night-time adventure. Goldblatt and friends escape from Glencobrooke Retirement Home to indulge in a night of hi-jinks, including a dip in someone else’s swimming pool, stops at a dance club and tattoo parlor, and Fourthmeal Taco Bell. They arrive back at the retirement home justas the sun is rising with “new friends” and many memories. The commercial is set to the music of “We Are Young”, sung in Spanish by Taco Bell® Feed the Beat® artist Fun. 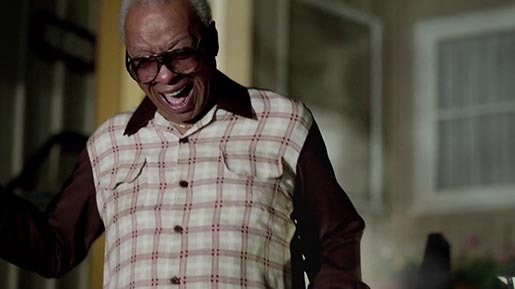 “Viva Young” will air towards the end of the second quarter of the game broadcasted Feb. 3, 2013, on the CBS Television Network. the Viva Young spot directs consumers to the brand’s Facebook page to learn more about “LIVE MÁS® Monday,” a post-game giveaway for a free churro with any purchase during regular store hours on Monday, Feb. 4. “Grande Papi”, a pre-game ad set to the 1994 hit song “Big Poppa”, is a reflection of Taco Bell’s Mexican-inspired heritage, will also be sung in Spanish. In the commercial, a young father leaves his home with his infant child in his front baby carrier, headed to Taco Bell to purchase the new Cantina Bell® Steak Burrito, getting favorable looks and smiles from female passersby. The Taco Bell Super Bowl XLVII campaign was developed at Deutsch Los Angeles by chief creative officer Mark Hunter, group creative director Brett Craig, senior art director Gordy Sang and senior copywriter Brian Siedband. Filming was shot by director Noam Murro via Biscuit Filmworks. Music was produced at Elias Arts.